Set within 15 acres of mature gardens and grounds, this magnificent XVII century house has lovely mountain views and provides lots of privacy. This Portugal villa tastefully recently renovated interior retains the original features yet provides all the comfortable modern conveniences. The living area is beautifully decorated with comfortable sofas and doors leading onto the front patio, letting in lots of light. The kitchen is fully equipped and spacious. The formal large gardens with many different, quaint areas, invite guests to relax in the shade or eat your meals. The large swimming pool is surrounded by a patio with many sun loungers. Double bedroom and with ensuite bathroom. Spacious living room with comfortable seating, satellite TV, DVD player and music centre. Doors opening onto the front terrace. Guest toilet with shower. Large dining room. Doors opening onto a delightful balcony with tables and chairs enjoying beautiful views. Master double bedroom with ensuite bathroom and a separate living area with a sofa bed sleeping one adult or two children. Double bedroom with doors opening onto a balcony. Adjacent bathroom with jacuzzi jets. Two more bedrooms each with an ensuite shower room. Fully fitted kitchen with breakfast table, dishwasher, microwave, etc. Laundry room with washing machine. 3 double bedrooms of which 2 have twin beds. Each bedrooms has an ensuite shower room / bathroom and doors opening onto a balcony overlooking the swimming pool. Ample sunbathing terraces, lawns and flowerbeds surround the pool (12.5 X 6.5 metres). The depth is from 0.80 to 1.80 metres. Pool side shower, barbecue area, changing rooms and games room with pool table. 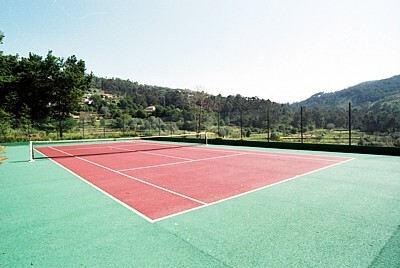 Tennis court on an upper level, with delightful views over the hills. Clients booking the main house only will have exclusive use of all facilities and the cottage will be closed. THE WEEKLY RENTAL COST WILL BE REDUCED BY 200 EUROS. Clients booking the main house only will have exclusive use of all facilities and the cottage will be closed.